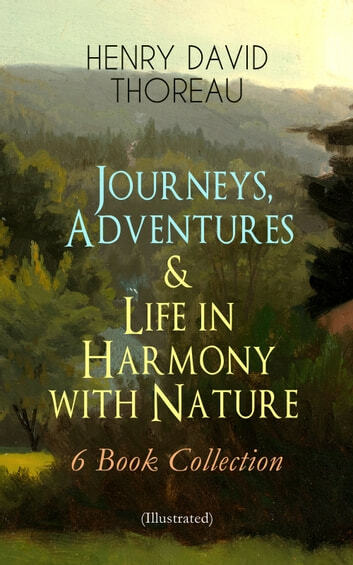 This carefully crafted ebook: “Journeys, Adventures & Life in Harmony with Nature – 6 Book Collection (Illustrated)” is formatted for your eReader with a functional and detailed table of contents: “A Week on the Concord and Merrimack Rivers” is a narrative of a 2 week boat trip from Concord, Massachusetts, down the Concord River to the Middlesex Canal, to the Merrimack River, up to Concord, New Hampshire, and back, taken by Thoreau and his brother John. It covers diverse topics such as religion, poetry, and history, which Thoreau relates to his own life experiences. “Walden” details Thoreau's experiences over the course of two years, two months, and two days in a cabin he built in the woods near Walden Pond, Massachusetts. 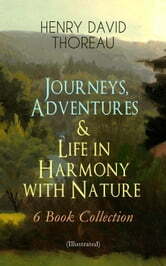 The book is a reflection upon simple living in natural surroundings. “The Maine Woods” is a collection of accounts of 3 different trips Thoreau took to wilds of Maine, unified by his increasing fascination with the primitive world and the "wild," both environmental and psychological. “Cape Cod” is an account based on a few trips Thoreau took to Cape Cod. It depicts a journey through the dismal, deserted, unpopulated wasteland that was Cape Cod in the early 1850s, describing both the landscape and the rugged people who lived in it. “A Yankee in Canada” is an excursion book about Thoreau's journey to the region of Montréal and Québec in the Fall of 1850. “Canoeing” in the Wilderness is the record of the canoe trip through Main Woods. It is vast tract of almost virgin woodland, peopled only with a few loggers and pioneer farmers, Indians, and wild animals. Henry David Thoreau (1817-1862) was an American essayist, poet, philosopher, abolitionist, naturalist, surveyor, and historian. A leading transcendentalist, Thoreau is best known for his book Walden, a reflection upon simple living in natural surroundings, and his essay Civil Disobedience, an argument for disobedience to an unjust state.